The Nichols Library has a collection of local records and online resources to aid you with family history research. CH vital records. CH marriages, births and deaths from 1800-1900 can be browsed online. Vitals for years after 1990 can be searched in our collection of town reports. The library also a book cemetery records, which contains a name index and maps, compiled by the Center harbor Historical Society. Other local resources include our cemetery map (print) and the town’s interactive town map online (click “layers” to select which map you would like to view). HeritageQuest Online is a web-based collection of American resources. HQ includes U.S. census data, local and family histories, city directories, veterans records, serials, and bank records. Features include convenient research guides, interactive census maps, and more. Ancestry Library Edition is the world’s largest online resource for family history. It includes data from the US, UK and inter-national sources. Access to ancestry is through our three desktop workstations at the library. Users make an appointment or come by on a drop-in basis. 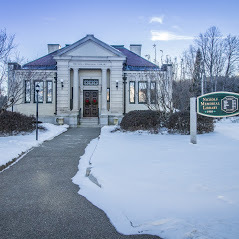 Access to HeritageQuest and Ancestry Library Edition are provided in cooperation with the New Hampshire State Library.